In Madame President: The Extraordinary Journey of Ellen Johnson Sirleaf, Pulitzer Prize-winning New York Times journalist Helene Cooper tells the remarkable story of Africa’s first female president, an unlikely trailblazer who survived domestic abuse, war, and political imprisonment, to finally find herself elected president on the surprise-strength of the woman’s vote. In 2005, Sirleaf was elected to lead a nation that had been decimated by conflict, left bereft of running water, electricity, infrastructure, or a functioning economy. Her election was a signal achievement owed, in no small part, to the grassroots mobilization of female voters, two generations of uneducated “market-women” raised on warfare, bloodshed, and trauma. As president, Sirleaf has addressed the US Congress in a passionate effort to relieve her country’s crippling debt; led her homeland through the terrifying onslaught of the Ebola pandemic; signed a deal with then Secretary of State Hillary Clinton that enshrined American support for Liberia’s future; and won the Nobel Peace Prize. 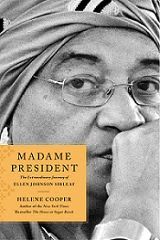 Helene Cooper, author of Madame President: The Extraordinary Journey of Ellen Johnson Sirleaf (March 2017), is the Pentagon correspondent for The New York Times. 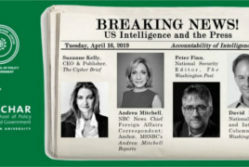 Prior to her assignment at the Pentagon, Cooper covered the White House, was the Times’s diplomatic correspondent, and served as an assistant editorial page editor. Cooper has reported from 64 countries, from Pakistan to the Congo. Before joining The Times, she worked for twelve years at the Wall Street Journal, where she served as a foreign correspondent, reporter, and editor. Born in Monrovia, Liberia, Cooper is also the author of the New York Times best seller The House at Sugar Beach: In Search of a Lost African Childhood (2008). She has appeared on Meet the Press, Washington Week, The Tavis Smiley Show, The Chris Matthews Show, and This Week, as well as twice as a clue on Jeopardy. She has received numerous award including: a Raymond Clapper award, Sandy Hume award, National Association of Black Journalists award, and an Urbino Press Award. Monday, March 6, 2017, 12:30 p.m. The discussion will be followed by a book signing with the author. two days in advance or you will be held responsible for the fee. 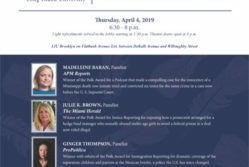 Please direct any questions to 202-429-2692 or programs@wfpg.org.